The Steel Collection custom-made curtain poles are manufactured in mild steel tube, with a luxuriously heavy 1.2mm wall thickness for unrivaled quality and strength. Using techniques perfected over time, poles are professionally and progressively bent to shape and cut to the exact size required for your project. The cut ends are cleaned and each end of the pole is drilled and tapped to take grub screws for fixing finials and/or joining pieces. Poles are then carefully polished using varying grades of polishing mops to achieve the required level of sheen (ranging from the high shine of the Polished and Brass toned finishes to the more subtle effect required from the translucent finishes such as Waxed or Oil rubbed). 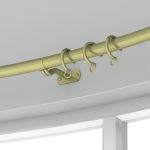 Poles are powder coated using specialised techniques in a selection of finishes in keeping with the traditional artisan positioning of the collection. These lustrous finishes add both visual appeal and durability, sealing and protecting the base metal from corrosion. The result is a lovely artifact, imbued with an intrinsic quality and which will fit your supplied window dimensions perfectly.